In our last installment we reviewed CrossOver Games for the Mac. 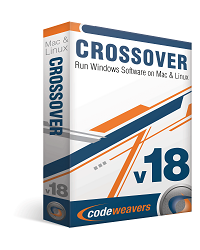 This week we will take a look at the current version of CrossOver Mac. 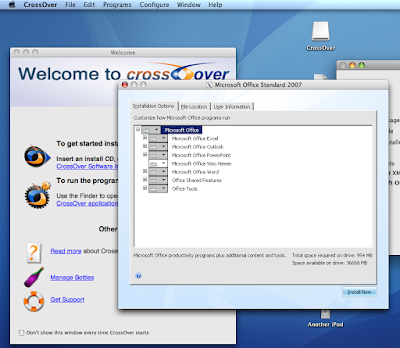 CrossOver Mac is one of the successor products to the CrossOver Office suite. 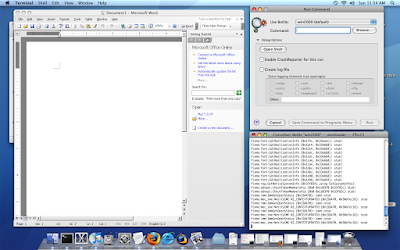 CrossOver which was once original for Linux, now allows you to run Windows applications such as Microsoft Office, Intuit Quicken and Quickbooks on your Mac. As stated in part one, CrossOver is based on the Wine project and as such shares some of its technical limitations and abilities. 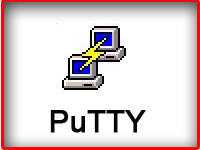 Wine is a compatibility layer for non-windows systems allowing them to run Windows applications. to a limited degree. Due to the highly complex nature of the software, third party vendors such as CodeWeavers package Wine to create a product for the end user. 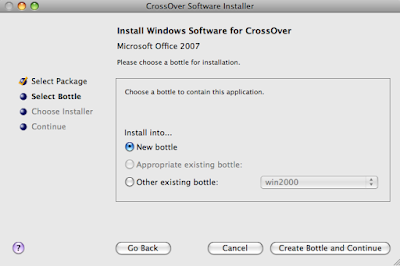 In part three we will go in to more detail about the internals of Wine and why it imposes limitations on the products built around it but for now, lets take a look at CrossOver 7 for Mac and the applications that it supports. 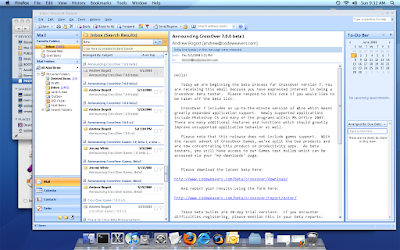 CodeWeavers has just released CrossOver 7 Mac which now provides support for Office 2007 based applications. 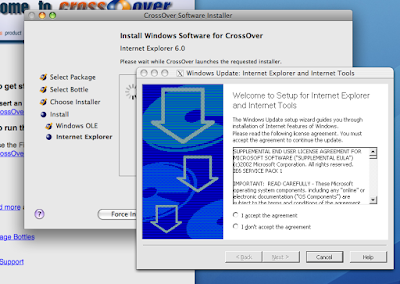 As this is new to CrossOver not all 2007 based applications work well at this time, right now only Microsoft Word, Excel, Powerpoint and Outlook 2007 are known to work and are supported. 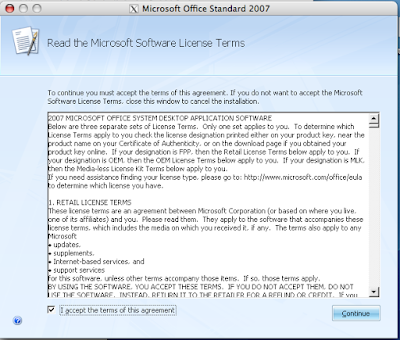 Prior versions of Office 2003 applications are much better supported, including support for Project 2003 and Visio 2003. 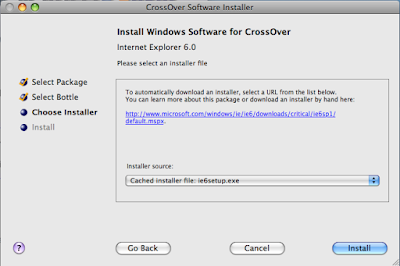 Installation of CrossOver for Mac is nearly identical to the steps outlined in the CrossOver Games review. After downloading you should be left with the file crossover-7.0.0.dmg, simply double click on this to start the installer which will then allow you to drag the CrossOver.app to your Applications folder. This should open the Applications folder Window Simply double click CrossOver to launch the application which will take you to the CrossOver welcome screen. 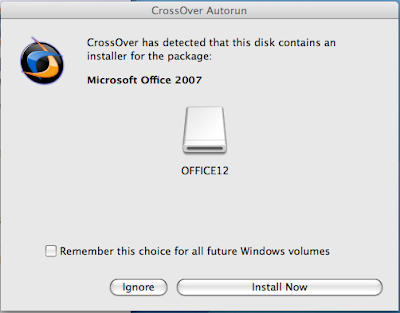 From this point you can now either insert a Windows based application in your Optical Drive or start the CrossOver Software Installer. There are some parts of the install where it looks like no processing is going on, take a break and come back. Time varies between 10-20 minutes upon hitting the 75% mark. There is a warning about the normal.dot document template on start up. Not fatal but annoying none the less. 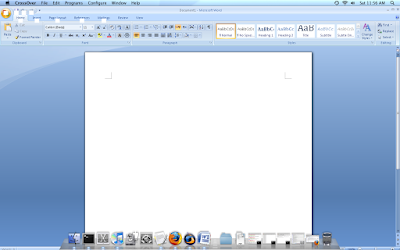 Word 2007 is a little slow drawing. The speed is a little slow like in Word 2007 but pretty good overall. Exchange, RPC over HTTP works good, POP/IMAP not so good unless you install IE. Access 2003/2007 - Does not work, don't even try it. I hacked around with it for a while and got it to come up with the ability to have read only access to databases by installing the MDAC and JET drivers manually. It's really not worth the trouble at this time. Project 2003 - Works perfect in my limited test. 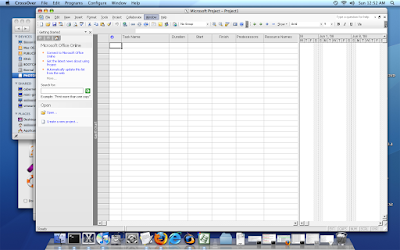 Visio 2003 - Drawing performance suffers at this time on CrossOver Mac. My inside sources tell me this is to be fixed in 7.2 with a new DIB engine. 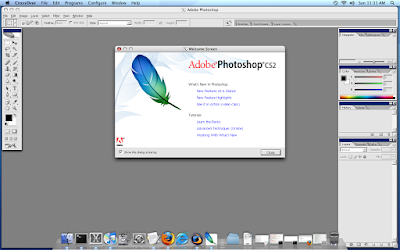 Photoshop CS/CS2 - Works perfect, while mac users already have Photoshop, the Windows version might come in handy if you have plug-ins that are Windows only. IE6: Works well enough, some minor glitches such as occasionally having to hit enter twice to naviagate to a URL but its pretty rare. CodeWeavers needs to get on the ball and figure out if there is a way to support IE7. Because CrossOver Mac and CrossOver Games for the Mac share the same basic tools and tweaking steps, I will forgo the TWEAKING and UNSUPPORTED STUFF sections and focus on other features and information that will help to make either version of CrossOver more pleasant to work with. 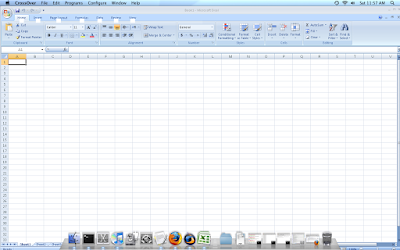 I really like the integration that CrossOver provides with the Mac OS desktop. The menu and dock integration is quite nice and makes it feel quite seamless. 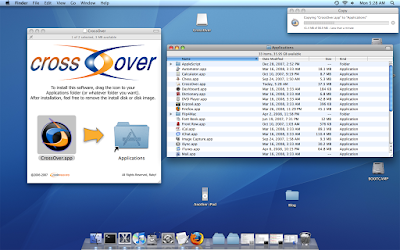 CrossOver -> Revel in Finder -> Browse for the correct icon for your application and drag it to the Dock. Now any time you want to start your application, you can do this directly without having to start the CrossOver application and browsing through the CrossOver menus. 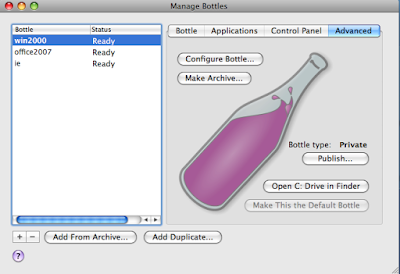 Multiple user support/What the heck are bottles? You should rarely if ever need to access or even be aware of this, as CrossOver maps the Documents, Desktop and Downloads locations the Windows applications expect to those folders located in your user account. However there are certain instances where the logic behind bottles does need to be explored. If for instance you have multiple users that need to share a single install of a Windows Application across multiple accounts. CrossOver provides you with the ability to do what's called Publishing a bottle where the bottle is shared across multiple user accounts. 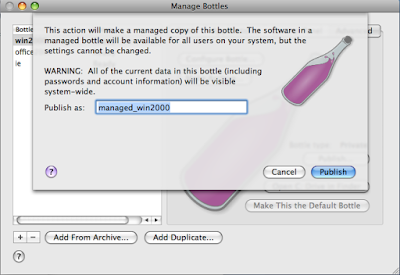 Each user then maintains a shared copy of the managed_bottle which is linked to the main managed_bottle in the main user account. Consult the documentation for more information. 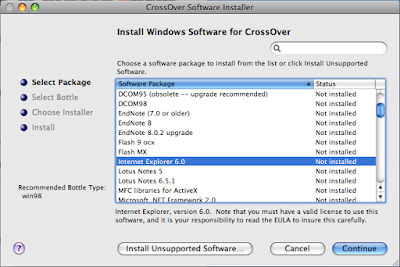 If your application is among those supported then I highly recommend CrossOver Mac. 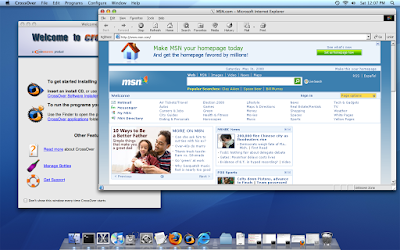 Its a good light weight alternative to the VM based solutions of Parallels Desktop and VMware fusion. I believe CrossOver Mac is worth the current price of $59.95 even with the hiccups I have encountered. And even if your favorite application isn't currently supported I think there is value in buying the software to contribute to future Wine development. Unfortunately not everything is supported but newer applications are being added all the time. From my discussions with the CrossOver team, they have informed me that a future release will add support for Quicken 2007 and Quickbooks 2006 and 2007. 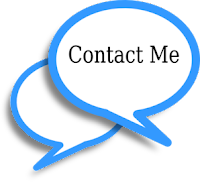 Even if your application does not work perfectly, the CodeWeavers support staff are very helpful and they maintain an application support database that might help with any problems you encounter.